I am totally obsessed with throw pillows, and when it comes to Christmas, it’s all over. I LOVE having cozy pillows around my house all the time, but especially during the holidays. 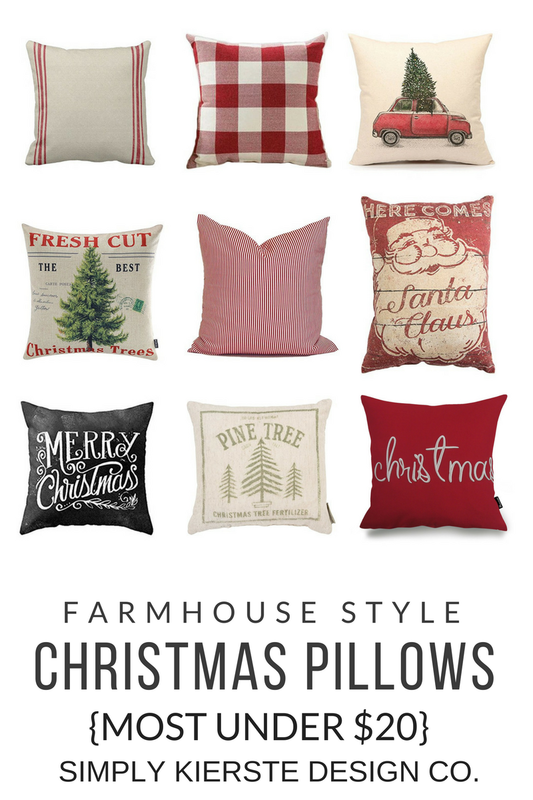 I’m also all about a good bargain, and I’ve been on the hunt for darling farmhouse Christmas pillows that fit my budget. I found so many adorable pillows, and most of them are under $20, with several of them under $10!! All the farmhouse classics are here…ticking, striped grain sack, chalkboard, buffalo check, vintage Santa, and more. Aren’t they adorable? I want every single one of them! I’m trying to whittle down my list right now…eek! I love to add pillows to every part of my home, and they’re a perfect way to add a little Christmas charm– tucked into the corners of your couch, on a bench or bed. Since my home is mostly neutral, pillows are the way that I add color, and since red is my most favorite color, Christmas pillows are so fun for me. My favorite fabrics are also perfect as pillows–ticking, gingham, buffalo check, feed sack, grain sac–and they not only add color, but texture too. Pillows are definitely one of my go-to decor favorites! This post contains affiliate links for your convenience. If you click on a link and make a purchase, I receive a small commission at no extra cost to you, and it helps support this blog. Other Christmas posts you might like…and check out my Christmas page with tons of ideas HERE! I love these pillows! 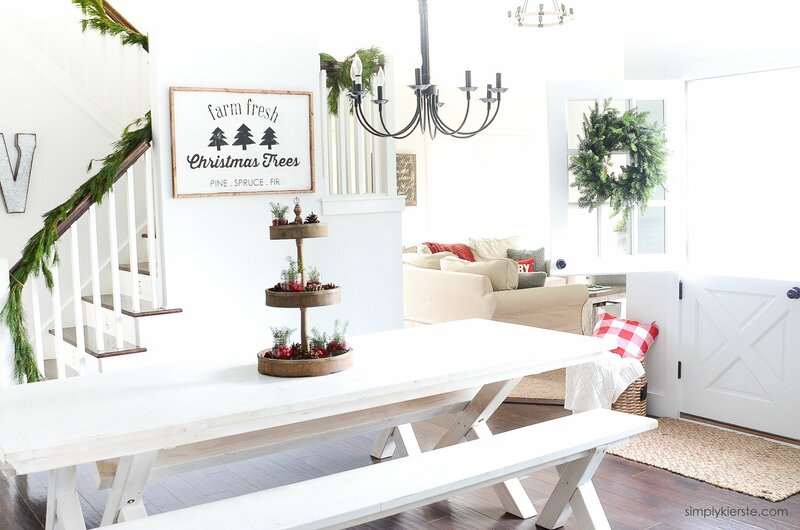 I want to change up my Christmas decorations to reflect more of a farmhouse theme, so these are perfect! Where did you get your dining room chandelier? I just love it’s simplicity. 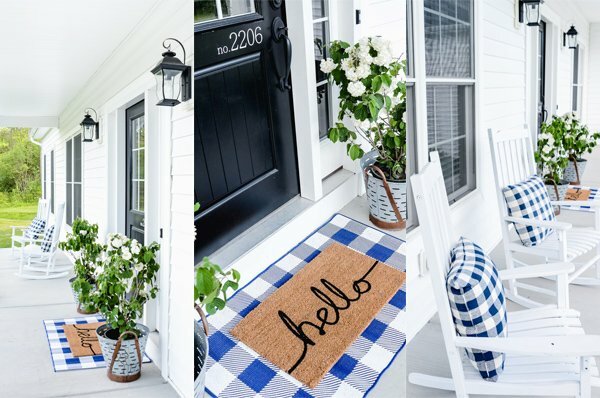 Cute, cute Farmhouse style pillows! Thank you for this post!! And, I just LOVE your red & white striped pitcher. Where did you get it? I found it at Home Goods last Christmas—I fell in love with it immediately! It’s worth a try checking there this year, just in case, if you have one near you. All the links are in the post…just click on the name of the pillow, and it will take you to where you can find them! The Fresh Cut Christmas Trees link goes to a different cover. Can you tell me where to find it? Thanks! LOVE the farmhouse pillow cases! So much better to be able to just change out and store pillowcases than to have a bunch of pillows! That totally happened to me when I went back to put it in my cart! It was there, so I think it must have sold out. Hopefully it will be back!! Can you e-mail us when the FRESHLY CUT TREES comes back in stock. My wife loved it. I’ve spent the past 45 minutes searching for it…. and then found this thread…. Hi, Paul! If I see it come back in stock, I will let you know! I’m sorry it’s already gone. I know how frustrating it is to search for something and not find it. Bummer! I hope so too! You chose a wonderful selection though!